Welcome to InterNations, welcome to DC and (hopefully) welcome spring! Whether you are new to DC or new to InterNations, our monthly happy hours are a great way to meet new people, learn about the organization and relax in a low key atmosphere. 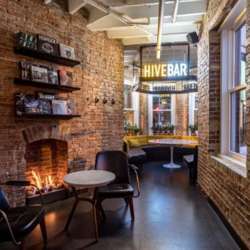 We will be meeting at Bar Hive at 2224 F St NW, Washington, DC. The bar is on the main floor of Hotel Hive, a mere 5-minute walk from the Foggy Bottom metro (blue, orange, silver lines). When you get out of the metro, walk away from the circle on 23rd St, NW. Hive Bar offers guests a highly-curated taste of The District, featuring uniquely craft cocktails developed in collaboration with local distillers. In addition, &pizza is right next door. Come join us to mingle and meet other expats, and make new friends.